UPDATE! May 2, 2018 - Sarah has been adopted! · Fence Required: Yes - Flight Risk! · Obedience Training Needed: Extra Training Needed - Scared of Everything! · Reaction to New People: Scared of everyone. She will need a little time to warm up to you. Sarah loves other dogs. Sarah is a hound mix, approximately 1 year old. She is seeking a family or person who will give her some time to warm up to you. Very sweet but very scared. Sarah ended up in an overcrowded kill shelter in rural North Carolina. She was turned in because the owner could no longer care for her. She is about 35 pounds and has reached her full grown size. Sarah is extremely friendly around other dogs and cats. She is micro chipped. Please feel free to contact the rescue in North Carolina, Chris Rogers at 973 975 8383 or crogers@giofund.org for more details. If you'd like to meet Sarah, please complete an application at www.ehrdogs.org & be sure to mention her names - Sarah! Sarah will be in NJ and ready for adoption or a foster home in May. FLIGHT RISK! Experienced foster or adopter needed! 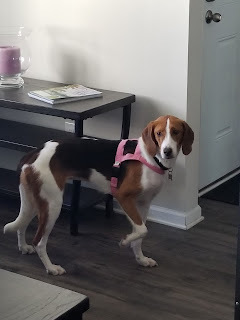 Good with dogs and cats, Good with kids, Good with Adults but very scared, Somewhat vocal, Does good in the car, Requires a yard, Leash-trained, Likes to play with toys, Playful, Affectionate, , Intelligent, Gentle.